Virginia’s junior senator has been able to call his congressional colleagues “cowardly” without alienating them. His thoughtful approach to government and his ability to navigate thorny issues with his Senate colleagues has earned him a lot of respect, says Sen. Mark Warner, a fellow Virginia Democrat, who has known Tim Kaine since they both attended Harvard Law School. Kaine served as lieutenant governor when Warner was Virginia’s governor. Kaine became governor in 2006 and was elected to the Senate in 2012. Since he took office in 2013, Kaine perhaps has been most vocal on his insistence that Congress vote on whether to authorize military force against the self-proclaimed Islamic State in Iraq and Syria (called ISIS or ISIL). He hasn’t been afraid to criticize the Obama administration on the issue. “His lead on the use of military force in the Middle East against the administration’s plan earned him tremendous credibility,” says Warner. Kaine says that, if Congress is asking the country’s service men and women to risk their lives, then it should be willing to face the political ramifications of an open debate about the use of military force. “I think we ought to authorize military action against ISIL with some conditions, but I don’t think we ought to be asking people to risk their lives without Congress doing our job,” Kaine says. The senator also has been outspoken about the need for reauthorization of the Export-Import Bank, which lends money to U.S. exporters and their foreign customers. The bank, created during the Great Depression, has been opposed fiercely by tea party-leaning Republicans, who view it as corporate welfare. The bank’s charter expired June 30, meaning it can make no new loans. Since this interview, the Senate voted in favor of reauthorization of the Export-Import Bank as part of a larger highway-funding bill, but that provision was removed from the legislation by the House of Representatives. Kaine also has been a proponent of a bill designed to give President Obama a better chance to negotiate global trade deals. The U.S. is involved in ongoing discussions surrounding the Trans-Pacific Partnership, which would include 12 countries on both sides of the Pacific Ocean, such as Japan, Malaysia, Australia, Canada and Mexico. The “fast-track” authorization means that, when the trade deal is presented to Congress, it will be required to make an up-or-down vote and cannot amend the treaty. Kaine long pushed for this authorization for the president, but that position has pitted him against many House Democrats who almost derailed the legislation in June. 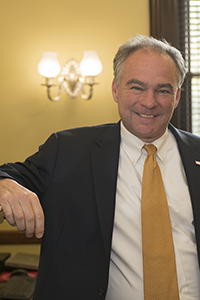 Kaine has said the trade deal could help Virginia exporters but adds that determining any positive or negative effects on the commonwealth will have to wait until the terms of the treaty are presented to lawmakers. Because of its large military presence and abundance of defense contractors, Virginia’s economy could take a major blow if Congress doesn’t find a way to avoid sequestration by Sept. 30. Kaine has been at the forefront of efforts to prevent another round of sequestration, automatic federal spending cuts that will be triggered if a budget deal is not reached. A compromise budget bill passed in 2013 lessened the impact of the first round of sequestration cuts, but state leaders fear the second round could be even more damaging. “As of today, 95 of the 100 senators are on the record saying the budget gaps imposed by sequester are bad for the country, and we ought to find an alternative,” says Kaine. Virginia Business discussed these and other issues with the senator in early July in his Washington, D.C., office. Virginia Business: You’ve been on the forefront of efforts to avoid the expiration of the Export-Import Bank’s charter. Now that the [Export-Import Bank] has expired, do you see a way forward for that and what are you hearing from Virginia businesses on how this will affect them? The key is we’ve just got to get it done. There’s just no reason to let this go, this great institution that has been in place since the 1930s that other nations have. They have their versions of the Ex-Im Bank. Why would we want to unilaterally disarm in this quest for export markets? I’m going to do all I can. I’ve written op-eds about this and been strongly supportive of Ex-Im Bank authorization since I came into office, and I’m going to continue to do it. VB: Also important for Virginia businesses could be the Trans-Pacific Partnership. How do you think a trade deal like this could help Virginia businesses, and is there concern as to how it might affect Virginia manufacturers? Kaine: I think the real issue is you’ve got to see the deal. I voted for a Trade Promotion Authority to give the president the maximum leverage to negotiate the best deal for American businesses, workers and farmers. Because I think Virginia agriculture has a lot of potential upside in the deal. But the bill that we voted on, the Trade Promotion Authority, just gives basically the president tools to negotiate the deal, requires him to bring it back, and then when it comes back, there will be a period of somewhere between 90 and 120 days where the deal will be on the table. [Under the law, it can’t be amended], so everybody gets a chance to look at it: the press, the public, labor, environmentalists, businesses, members of Congress. We all get a chance to look at it and debate it. We have to decide: Does it do the right thing to promote Virginia jobs and American jobs? I think that the key for us, and the reason why deals like this can make sense, is that trade is going to happen. It is going to happen, and it’s already happening. The only issue is whether the rules surrounding trade will be rules that will be favorable to us. That will require elevated standards for environment, worker safety, labor protections, intellectual-property protection. And if we are helping write the rules, they’re more likely to have those higher standards. If we don’t, trade will still happen. It will just be according to lowest common denominator rules that are much more likely to hurt Virginia manufacturers. And hurt others. I do think, in Virginia, we have some unique assets that enable us to really take advantage of global trade [like the Port of Virginia and Washington Dulles International Airport]. But I think Virginia has benefited tremendously in my lifetime by trade. Trade has cost us jobs, too. You know, we’ve lost jobs because of trade, in textile and furniture, especially, but in some other manufacturing areas, too. But while we’ve lost jobs, we’ve also seen industry sectors in Virginia that have dramatically expanded because of trade. VB: One thing we’re concerned about is sequestration cuts. I was wondering how likely you think it is that we could avoid the next round [of sequestration.] Looks like it could be especially difficult for Virginia. Kaine: Sequestration affects Virginia more than virtually any other state. Between federal employees who live in Virginia [and] defense contractors who are part of the defense-side budget, we get affected very dramatically. I worked very hard on the Murray-Ryan [budget deal that avoided about half of sequestration cuts in 2014 and 2015], a two-year deal that runs out on Sept. 30. We need to find a budget alternative to sequester, and I’m with working with a small group of Democrats and Republicans right now to do that. You know, the Murray-Ryan budget deal was a classic compromise. Democrats didn’t get everything they wanted. Republicans didn’t get everything they wanted, but we found a compromise, and it was the right thing for the country, the right thing for our national defense and the right thing for other key priorities. We need to do the same thing this year, so between now and Sept. 30, that’s a task that we have. Because I’m a member of both the Budget and Armed Services committees, I’m very engaged in that effort to find the alternative to sequester. As of today, 95 of the 100 senators are on the record saying the budget gaps imposed by sequester are bad for the country, and we ought to find an alternative. There is significant support for the general proposition, but finding the alternative itself that will get 60 votes in the Senate is what we’re working on now. VB: You mentioned that you sit on the Armed Services Committee. We talked about sequestration, is there anything else that you think Virginia should be concerned about or excited about? Kaine: I would say a concern is sequestration, and that’s a huge one, but there are some real opportunities. There are huge opportunities in the unmanned aircraft space that a number of Virginia companies … have been doing some of the real pioneering work. Those innovations have civilian uses, not just military usages. We’ve got a tremendous need to up our game when it comes to cyber. We’ve got a lot of expertise in Virginia. You might see more of the military budget moving over into the cyber side, and I think Virginia has some prospects there. VB: You’ve taken a tough leadership stance on military authorization fighting the Islamic State. Have you been able to gain any traction? We are now really engaging on the discussion on authorization. We’ve had a series of closed-door committee meetings after a series of open-door hearings…exploring: Can we come up with a bipartisan authorization? Above all else, we need to authorize it. We shouldn’t let presidents start wars without votes of Congress. But, second, the authorization, to be really successful, should be as bipartisan as possible. And since both Democrats and Republicans support military action against ISIL, we ought to be able to find a bipartisan path forward. VB: And you were in the Middle East? Kaine: Yes, I just got back. I went with six members to Iraq and Turkey. In Turkey we really were right on the border of Syria….And I came back even more convinced that Congress needs to engage, especially because of our troops. We’ve got troops overseas from Virginia, who are over fighting against ISIL. There are many Virginians in this 3,500 that are there. And they deserve to know that Congress cares…If they’re risking their lives, then we ought to at least be able to have a debate and vote on whether the mission is worth it. Because if we’re not willing to say the mission’s worth it, then how dare we ask them to go risk their lives to fight this enemy. I think the mission is worth it. I think we ought to authorize military action against ISIL with some conditions, but I don’t think we ought to be asking people to risk their lives without Congress doing our job. VB: [What’s the environment in the Senate like?] I mean from the outside it appears like it’s just partisan vitriol all the time. Is that how you feel? Kaine: You know, I actually….I’ll be kind of blunt. I think the interpersonal relationships are warmer and friendlier in the Senate than they are in the General Assembly right now. And I mean from the very first day I got here, even though there are some really hard issues and things that I find mystifying — like why would Democrats support Ex-Im Bank reauthorization and Republicans be all opposed to it. I just don’t get that. So there are frustrations here, but I actually think the warmth of the personal relationships in the Senate, I think that my observation is that they’re probably a little warmer and a little closer than in the General Assembly. VB: And that’s from when you were there or now? Kaine: From when I was there. I don’t know it so well now, but what I’ve seen from afar doesn’t suggest to me that it’s changed that much.